Fellow blogger Jacqueline – over at www.jacquelinerose.ca, and I are on a fitness kick and we’ve made ourselves a bucket list of hikes we’re hoping to accomplish this summer. We took advantage of the beautiful weather this past Sunday and the Canyon Creek Trail was the first to get checked off the list. This trail holds a special place in my heart. I used to take the boys here all the time when they were little. It was easy to get to, is a beautiful trail and the creek is a playground and a half for little boys. At only 3.3kms long it’s totally doable for active little ones. My boys went there frequently between the ages of six and ten. To get there you have to head north on the Willow Creek Rd. for approximately 4kms, taking a right at the Emerson Lakes Rd. (at the 9k sign) and the parking area for the trail is on the right, just after the 18k sign. It seems weird to head up the Willow, to turn your back on the mountains, in order find a scenic hike around here but trust me you’ll be pleasantly surprised if you do. It was actually a write-up in the local paper, nearly 15 years ago, that convinced me to go check this one out in the first place. There is ample space to park your vehicle at the trailhead and there is a large sign and map with information about the area so it’s welcoming and easy to get started. The trail starts immediately to the left of the sign and heads straight off into the woods. Only a short distance in we came to a fork in the trail and a ‘You Are Here’ sign. I have always gone right here. I’m pretty sure the trail is signed as though you go left here and I don’t know why I go right, but I do. Either way is fine, you will loop back to this spot. It was immediately obvious that any concerns I had about the trail being too wet were unfounded. It is really, really dry in the bush right now. Before you even get to the creek, which you can hear almost from the start, there is a picnic table and fire pit – a perfect location for a quick lunch if you’re not feeling up to a hike. Please use safe fire awareness practices. 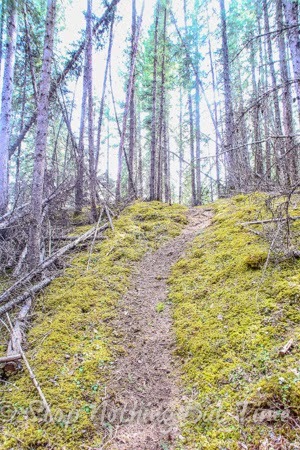 It only takes a few minutes before you are following a narrow, winding trail along the creek. It is a beautiful, clear creek lined with large rocky banks. According to FRMA’s website there are fish, including rainbow trout and whitefish. I haven’t fished here yet, but I think I will try soon. The creek lends itself to exploring. The trail is maintained by FRMA and according to their website it is cleared every spring. It looks like we beat them out this year. The trail is clearly marked and easy to follow, but there are several downed trees along the way that we had to go around. I mistakenly wore capris and ended up with a lot of surface scratching from all of the bushwhacking through the rose bushes. My mistake. There are several trees down across the trail this early in the season, all were easily navigated around and the trail has always been clear in the past. The trail rises and falls fairly steeply at times, with a total elevation gain of 1408m, and at other times you are walking very closely to the edge of a beautiful canyon, giving vast views of the surrounding treetops straight through to the mountains. This hike takes longer than the distance indicates, just because you stop so many times to appreciate the canyon. Although it’s true a lot of those stops were me pointing to this or that and talking about remembering the boys here or there. If you are taking children on this hike, they must listen and stay close – the danger of falling is very real, but only if they are off the trail, stay on the trail and you’re more than safe. The scenery within the canyon changes from rocky canyon walls that look like moss covered fairy gardens to something dry and stark like hoodoos. The forest floors are lined with moss and even early in the year, before the leaves have sprouted, it is so very green. At the half-way point there is a small offshoot trail to the right of the bridge that takes you down to the Athabasca River. I highly recommend taking the detour to the river and eating lunch there. The bridges across the creek are sturdy and well maintained. The hike back up the far side confirms your earlier thoughts, that what goes down, must go up. It is a moderate uphill climb, luckily with a bench at the top and a great view as your reward. Bring water, a walking stick and a pack with some first aid essentials and you will enjoy this hike. Great blog post! Love the pics!